TV5 has released a statement saying it stands by its report on the spoiled relief goods found inside a warehouse identified as a DSWD hub in Tacloban City. The network also posed a challenge to DSWD Secretary Dinky Soliman, saying,“We challenge Secretary Soliman to substantiate the charge that any scene in the report was staged or manipulated in any way, beyond the standard edits necessary to produce the news story for the broadcast audience." Soliman, in a statement, said that the TV5 news report was misleading and that it had been spliced in from different footages. “TV5 reiterates that it stands by its March 26, 2014 story on the spoiled relief goods found inside a warehouse identified as a DSWD hub in Tacloban City. “The network also takes offense at the DSWD secretary's charge that its footage and report on the matter were ‘manipulated.’ Any suggestion that the network or its crew contrived the scenes aired must be viewed as malicious and irresponsible coming from a public official. “We challenge Secretary Soliman to substantiate the charge that any scene in the report was staged or manipulated in any way, beyond the standard edits necessary to produce the news story for the broadcast audience. “TV5 has conducted an internal inquiry into the production of the story and has found the report fair, credible and truthful. The conduct of our reporter and camera crew were professional as well as transparent. “Raw video footage bear out the claim that the warehouse in question was prominently identified as a "Task Force Yolanda - DSWD Hub". In fact, this warehouse is within the National Food Authority (NFA) compound and it was the very same facility that Pres. Benigno Aquino III visited days after Typhoon Yolanda struck in November 2013. “TV5 also sought the side of DSWD personnel in the area as well as that of Secretary Soliman but failed to get a response. 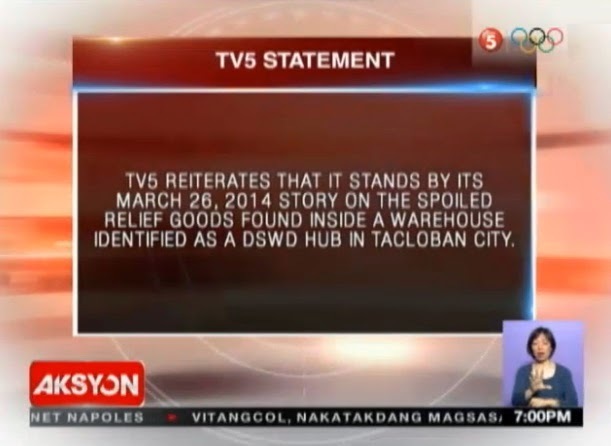 “A day after the story aired, DSWD Region 8 personnel called up the TV5 news team in Tacloban City to ask for pertinent details, including the location of the warehouse, which it promptly gave. Once again, TV5 asked them for an official statement and update, but none came. “The DSWD is splitting hairs to deflect accountability. As a "DSWD Hub", the warehouse was under the jurisdiction of the national government, specifically the DSWD. Its assertion that the warehouse was being manned by the World Food Programme (WFP) does not change nor negate what is ultimately at issue here: the unkempt, irresponsible, wasteful, and hazardous handling of relief goods that continue to be sorely needed by citizens devastated by Typhoon Yolanda (Haiyan). Official ownership of the warehouse is not the ultimate problem.